Fresh Pear recipes are some of the best kinds of recipes to try. Pear squares recipe are one of our favorite desserts when produce is fresh on the farm. Simple pear bars are a perfect substitute for pie. 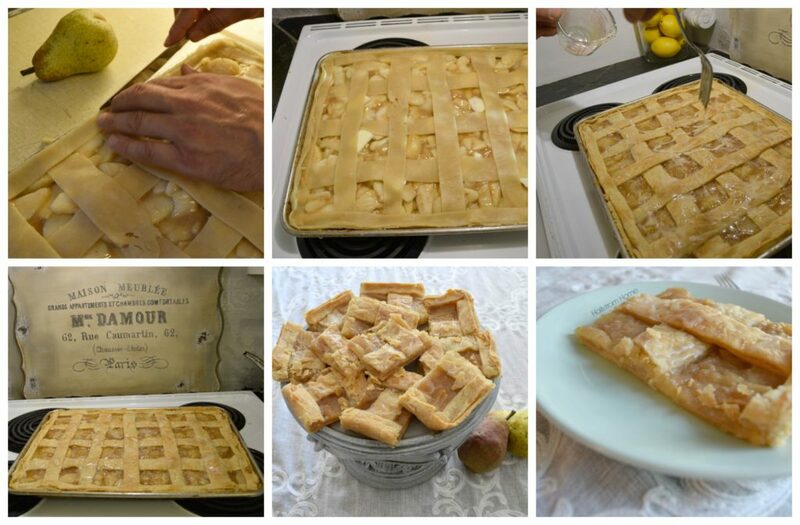 What makes these pear bars better than pie is they are so much easier to cut and serve. I love pie but these are to die for. I will share with you my Simple Pear Bar Recipe for Farmhouse Living. It has great flavor with the fresh pears paired with our simple glaze. Last Saturday I went shopping, and came home to find hubby making pear bars. Lets just say the waistline is expanding, but I can just blame him right? 😉 Please enjoy. What makes these pear bars so delicious is the crust. When making the pear square crust it is important to use the cold milk. It helps to combine everything. This recipe I shared with you is an oil crust. 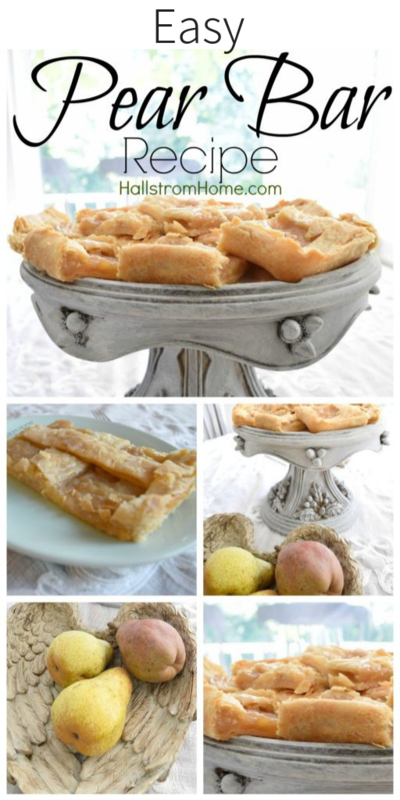 It is so flaky and great with my pear bars. Everyone in the house is always baking. We love to get out the old favorite recipes and keep them around in this crazy house of ours. The kids are always baking because they enjoy it so much and they love the final product. Of course I’ll share with you this pear recipe. I love making these for just a dessert at home, but they are also great for bringing over when visiting. I love this recipe so much because my kids can even make it. This is a definitely a recipe your kids can do! Mine offer to make this and they also love doing it. The pear bars also turn out so tasty in the end. Pears bars are the perfect treats for guests or just at home. They have the perfect glaze that compliments the whole dessert. Stir all ingredients together with a fork. Use 2/3 of the dough for bottom of tray and 1/3 set aside for the top strips of crust. Mix the pears, sugars, flour, salt and cinnamon together gently. Layer mixture on top of bottom crust. Add butter in pieces to the top of pear bar mixture. 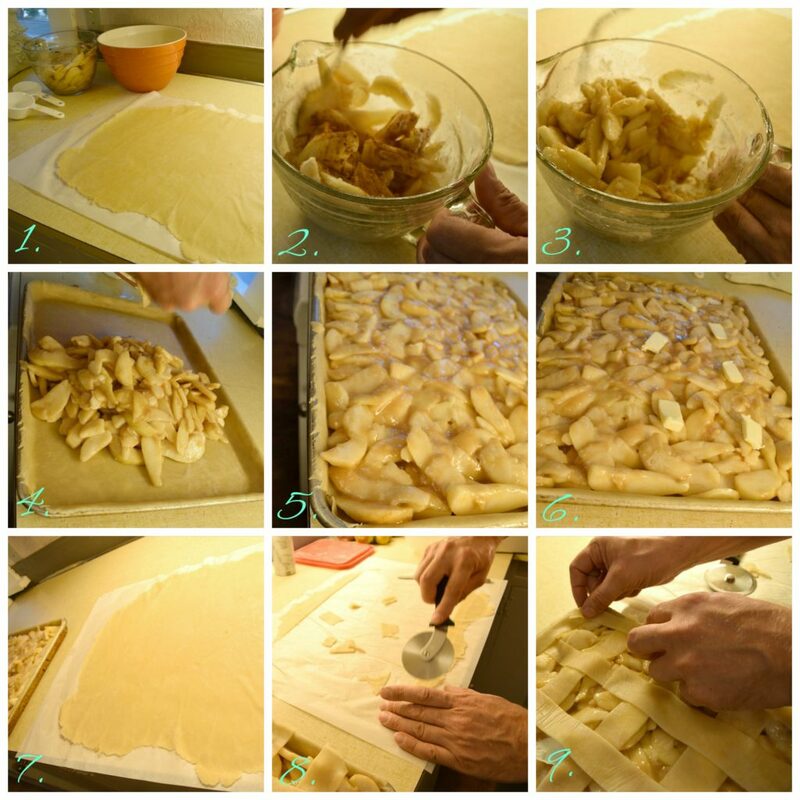 Apply strips of pie crust on top. Follow pictures for details. Bake at 375° for 40 min or until crust is golden brown and mixture bubbles. Whisk well and drizzle on top while warm. …and the final steps for our farmhouse pear bar recipe. You can really put the top crust on anyway you would like. One of the best parts is the oil crust. It has been in our family for a long time and can be used for anything. This oil pie crust is so delicious and flaky. This weave is simple, but looks so good. Even though these are more handy than pie, an old fashioned pie will still do the trick. 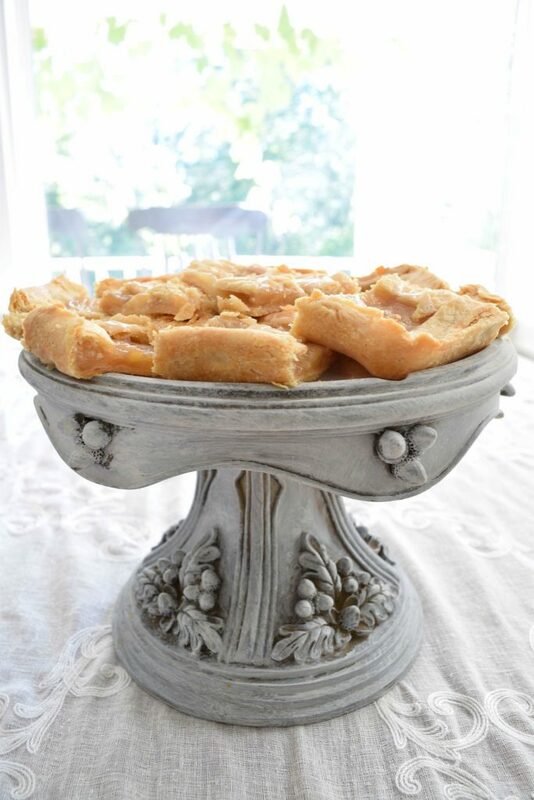 I have an old, delicious apple pie recipe. But of course you can do some substitutes for it, just like you can this recipe. Another one of my favorite parts of this pear bar recipe is the butter that is placed on top of the pears before baking. It adds depth to the pear bars, and richens the flavor of the fresh pears. Do you like baking? I love it, much of the time the kids take over though. Which I don’t mind one bit. Can I freeze pear bars? I personally wouldn’t because the pears have such a high moisture content. When they thaw out you will get a watery dessert. These are not something I recommend freezing. But I do have a chicken roll up dinner perfect for freezing. How long do pear bars last on the counter? The pear squares will last on the counter about 3 days. If you cut them and store them in plastic bags I would say they will last a couple days longer. What are some substitutes instead of pears? We use apples but you could use plums. Apples are a great alternative is someone does not enjoy pears. Another alternative is to add some raisins with your apples. Of course still keep the cinnamon in. You can play around with the spices and make it to your taste. I could just reach out and grab one of those bars…they look so yummy. Vic did a great job making those!! Oh believe me, he did an amazing job. I have to stop myself from eating too many!! Omgosh im sAliVating!! Pinning this nOw! ???????? Hi there! These look delicious! Two quick questions. The Filling recipe calls for 2/4 sugar. Is that to be 1/2 cup or is it a misprint of 1/4 cup? The filling also calls for 8-10 cups of pears. Can you give me an estimate as to how many pears that would be? One of my coworkers just brought in a Bunch from her grandfather’s tree and i’m wondering how many to grab. Thanks!